The Music Institute of Chicago believes that enjoying and understanding music and developing the skills to create and perform music enhance the quality of life and nourish the human spirit. Music teachers and arts therapists at Music Institute of Chicago, one of the oldest community music schools in Illinois, provide exceptional arts education and arts therapy to 5000 students. 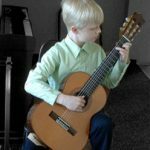 A non-profit arts organization offering lessons, classes and concerts to thousands annually through its Community Music School, Academy program and Nicholas Concert Hall.